We put this taco salad together in no time and it is loaded with so many good-for-you foods. Pretty too! Everyone picked their favorite toppings. This is a great option for introducing new foods to your kids. Maybe everybody chooses one thing that they never tasted before. They can leave out the things they don’t want. Ask them what other ideas they might have for toppings. And don’t forget to let them help you make the meal. When they help make it, they are more likely to try it! While browning the ground beef add all seasonings except salsa. When ground beef is cooked through, stir in the salsa. 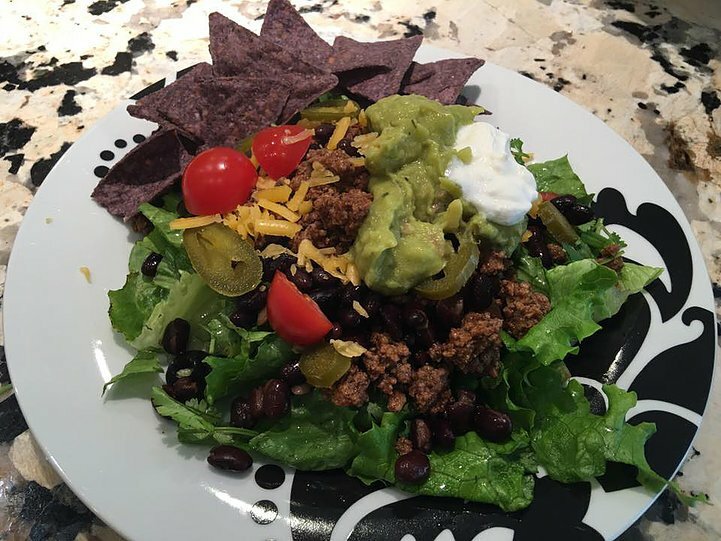 Assemble salad with romaine, chopped fresh cilantro, diced cherry tomatoes, squeeze of lime juice, sliced black olives, scoop of black beans, sliced scallions, jalapeño slices, shredded cheddar, guacamole, dollop of sour cream, and tortilla chips. Enjoy!